Headline inflation came in at 2.7% YoY in January, practically unchanged from the December CPI. However, this stability might be deceptive, with indications of accelerating underlying inflation. According to the Hungarian Central Statistical Office fuel prices fell by 2.5% in a month, translating into a 3% YoY drop. This change alone dragged down inflation by almost 0.3ppt from the December reading. 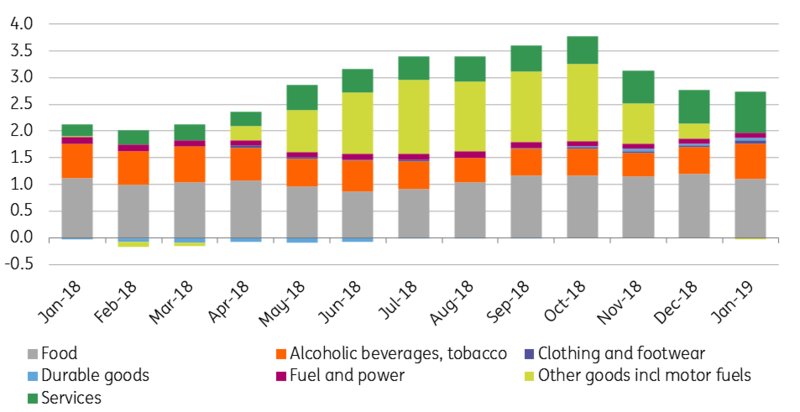 On the other hand the significant tax changes, mainly for alcoholic and tobacco products, pushed inflation of these products higher, adding nearly 0.2ppt. Inflation in durables and services also increased. The yearly-based price change in services reached 2.8%, a rate not seen since 2014, while inflation in durables also accelerated to a 33-month high. Core inflation accelerated by 0.4ppt to 3.226% YoY, exceeding the inflation target level for the first time in five years. More importantly, the NBH-calculated core CPI excluding indirect taxes is also up - by 0.12ppt to 3.0% YoY, the highest figure since 2011. Having only just reached the target, we hardly expect the NBH to pull the trigger already in February. 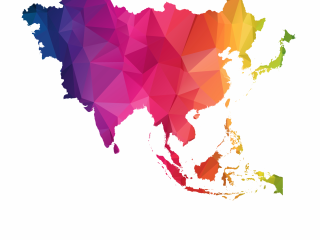 We believe it will definitely do so in March as we expect underlying inflation to strengthen further in coming months. We expect headline inflation to hover around the 3% inflation target, due to the oil price effect. Core inflation is expected to accelerate further to 3.4% YoY in February. 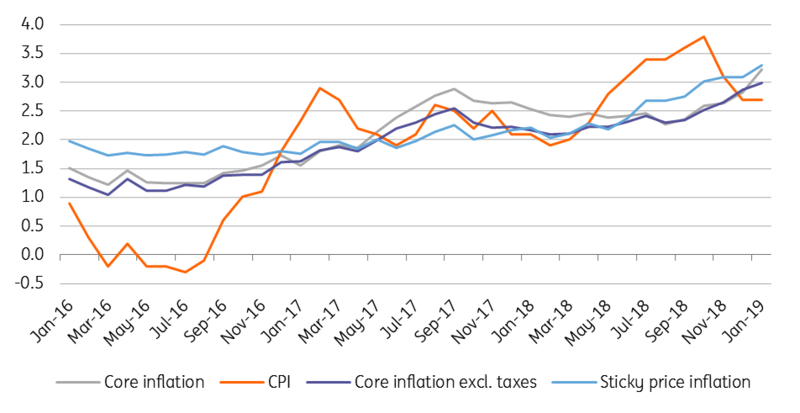 The tax effect in January came in at 0.24ppt and is expected to strengthen a bit - we expect core inflation excluding indirect taxes to rise above the target, reaching 3.1-3.2% YoY. This should provide more than enough ammunition for the NBH to pull the trigger in its March rate setting meeting, starting the normalisation with an adjustment in the stock of FX swaps and with a deposit rate hike.